I am a health and wellness enthusiast living in beautiful Seattle Washington. As a certified Integrative Nutrition Health Coach I work with clients on all aspects of their lives as I believe every part of our daily routines are interconnected and need to be looked at to reach optimal wellness. I also have a degree in journalism and do work as a blogger and freelance writer focusing on wellness topics. 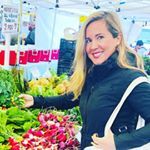 In addition to helping others with their health goals I'm passionate about fitness (I'm working on obtaining my certified personal trainer license now), farmers markets and spending time in nature. Demographic data for @edithagoston's audience is available for free to influence.co users.